Ways to honor: Be cunning and daring. Work smarter, not harder. Study divination and magic – both of the sacred and the stage variety. Gamble. Travel, especially if you find yourself in a rut. If you drop change, leave it. If you find some, pick it up and thank Hermes for the gift. Always deliver messages entrusted to you, especially those to and from the dying. Sit with a dying friend or relative. Be their guide to the next world. Give aid to the homeless, stray animals and travelers. See also Guardian of the Road, a devotional anthology in honor of Hermes from Bibliotheca Alexandrina. 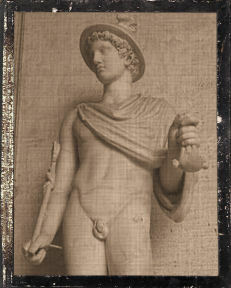 The complete 4th Homeric Hymn to Hermes (582 lines) can be found here.